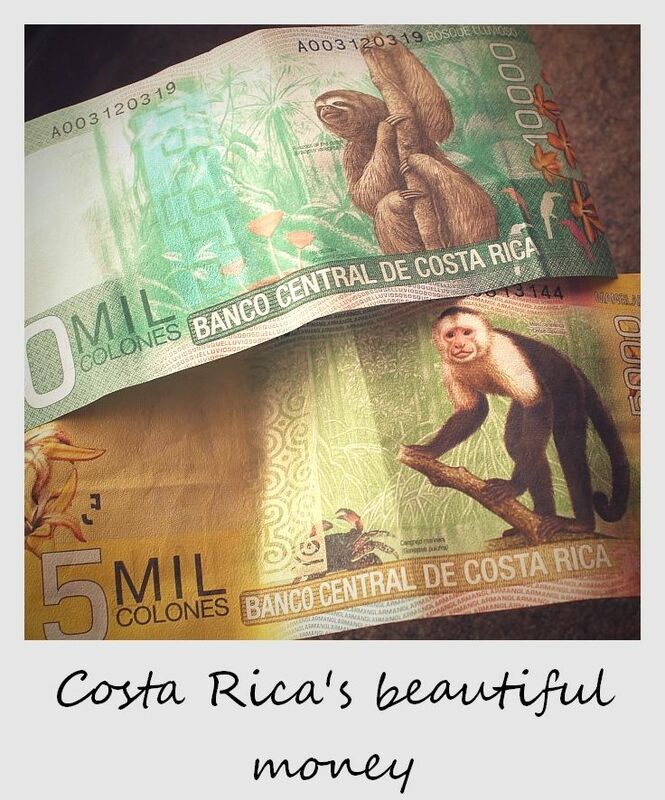 Known for its range of wildlife, the new Costa Rican Colones feature popular animals like sloths, monkeys, birds, sharks, butterflies, deer, sea turtles, scorpions and starfish along with some of Costa Rica’s diverse nature: a Guanacaste Tree, a Cloud Forest, a coral reef and mangroves. Definitely some of the most creative bills that we have seen around the world. What other countries have you traveled to with beautiful currency? 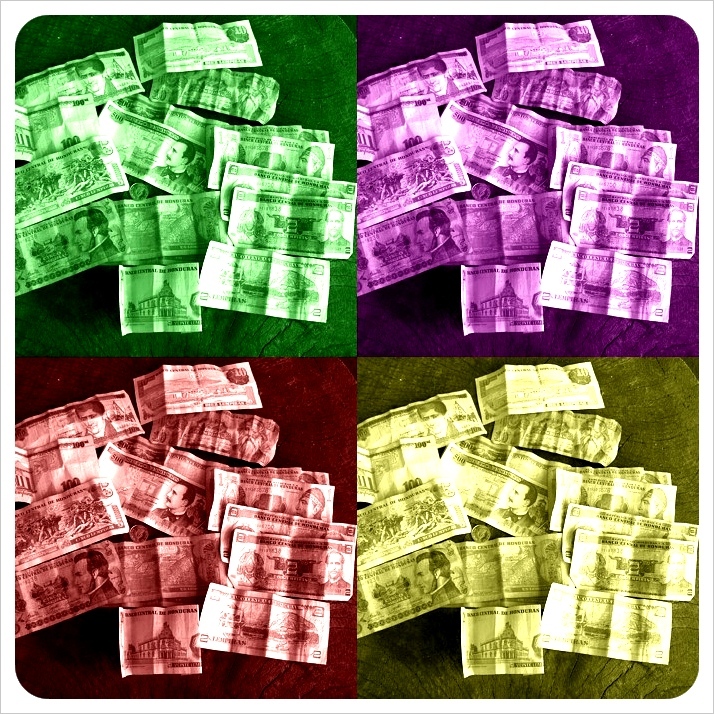 Do you save smaller bills when they are so pretty? ‘Haven’t you heard about the arribada?’ Christina asked us when we remarked how badly we would love to see some sea turtles. We heard it might be possible here, we tell her. 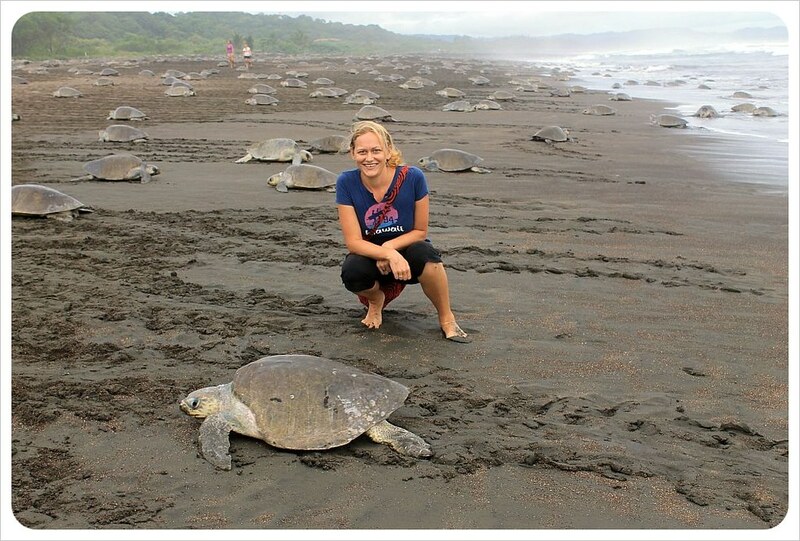 ‘Hundreds of thousands of turtles will come to lay their eggs on the beach, just a few miles up the road from here,’ she explained. 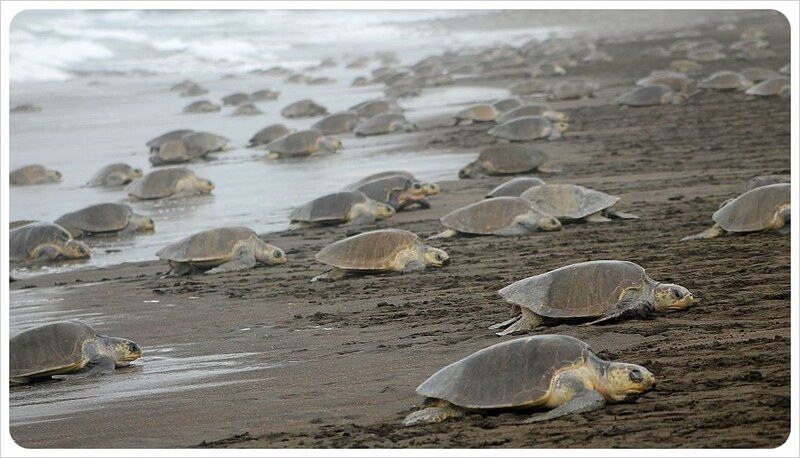 Four times a year, ten days before the new moon from August to November, masses of olive ridley sea turtles simultaneously swim out of the sea and lay millions of turtle eggs on the beach. We couldn’t believe our luck. 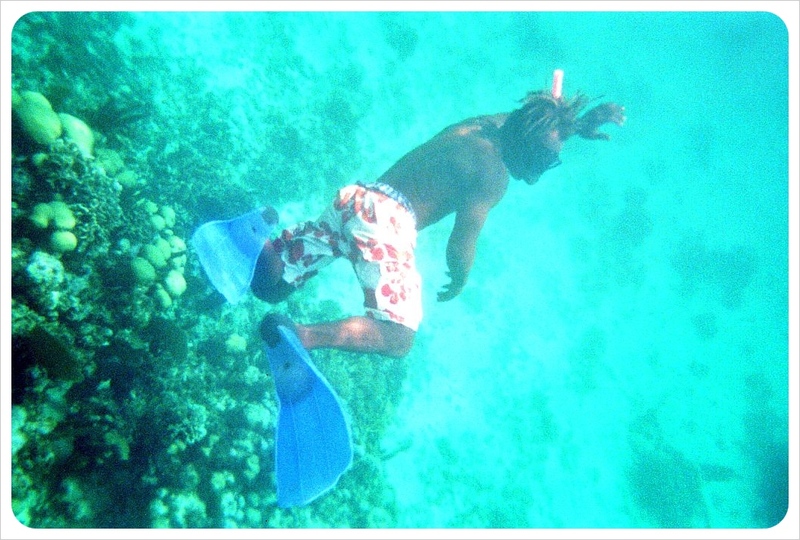 Of all our time snorkeling in the Caribbean, we have only seen one sea turtle. In just a matter of days, we would be seeing more in one place than most people could ever see in a lifetime during the arribada, a Spanish word roughly meaning ‘arrival into port or harbor’. The turtles’ arrival is not an exact science, so all we could do was wait it out. 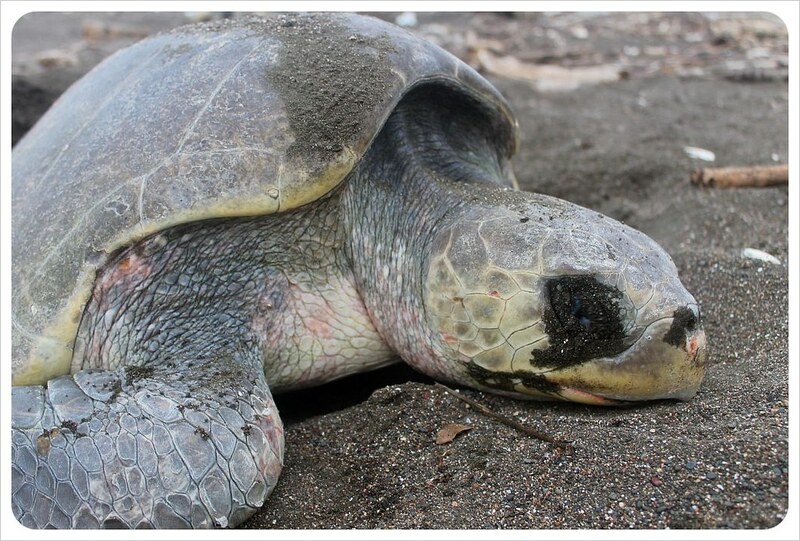 We checked Facebook updates from local turtle guides daily and finally a few days later, the start of an arribada was confirmed – for the very day that Jess was set to leave for a quick visit back home to Chicago. This was going to be one amazing experience the two of us would unfortunately not be sharing. When our friend Denise called to say we would head to nearby Ostional beach, I was dressed and ready in five minutes and could barely contain my excitement. 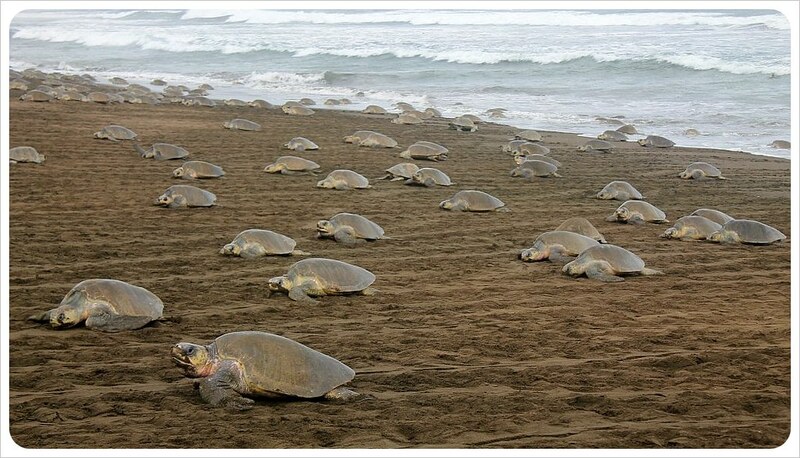 The arribada takes place in only a few places in the world, and Ostional beach is the second biggest nesting ground behind India. We parked the car a mile outside of the village and walked to the black sand beach, where I immediately spotted a lone turtle awkwardly digging her nest with her back flippers. I almost tiptoed over, awestruck at being able to witness this rare moment. At first the mothers-to-be arrive in ones and twos, slowly lugging their 40 – 50 kilo (90 to 100 pound) shells up the sandy banks to safe spots to dig their nests. They are not bothered by the onlookers who gather to watch the spectacle. Instead, their one-track minds focus only on digging holes roughly two feet deep. 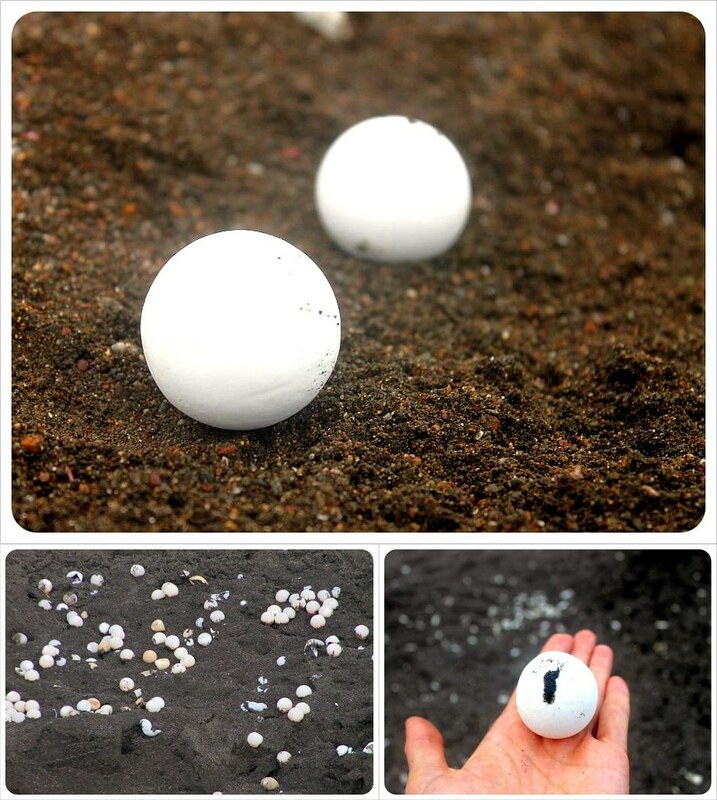 Within thirty minutes the turtles dig their nest and lay 80-100 white, round soft-shell eggs that are the exact size and shape of a ping-pong ball, then hastily fill in the hole and make a beeline back into the ocean. 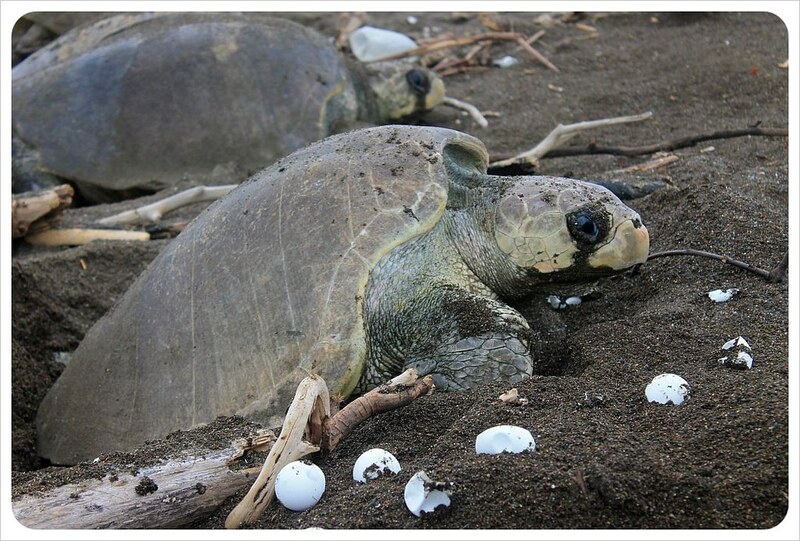 From the moment their backs are turned, the little turtle eggs are in grave danger. Hundreds of vultures hover and circle the nests as she plants the eggs and dive in and pluck out a few eggs the minute she leaves. 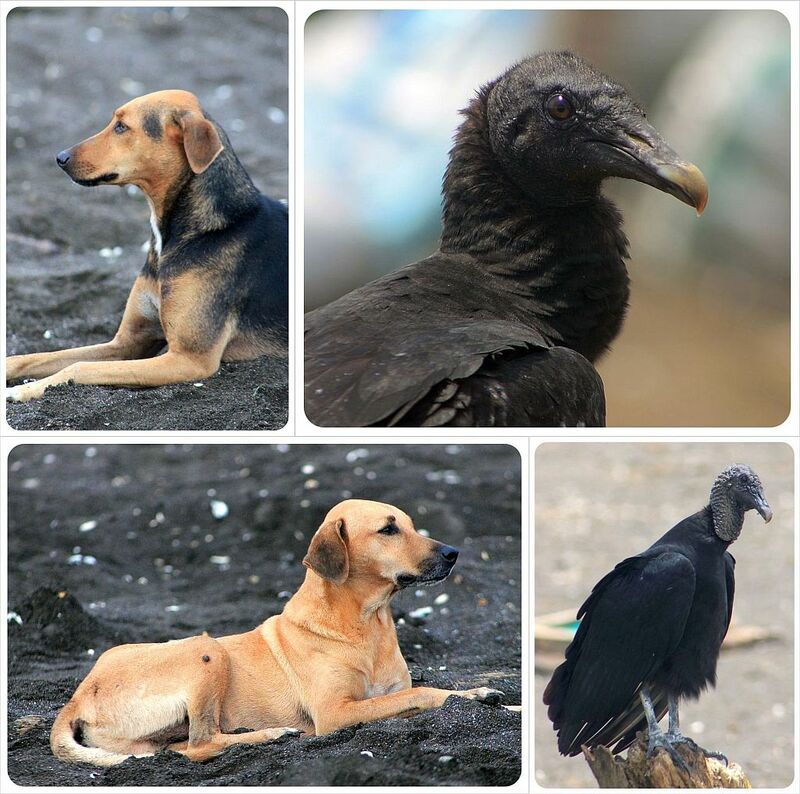 Then the stray dogs arrive, digging out much of what the scavenger birds leave behind, until being shooed away by the people of the village, who are permitted to collect and sell the eggs on the first two days of the arribada. 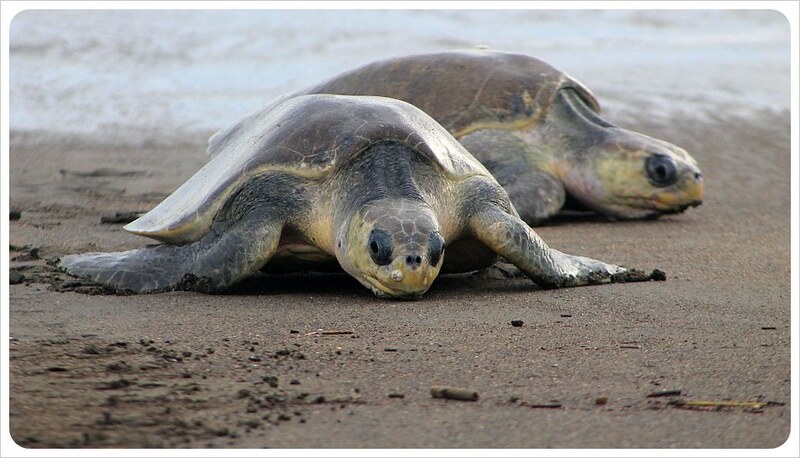 Despite the fact that olive ridley turtles are an endangered species, the locals are still allowed to collect the turtle eggs and earn well, up to $200,000 from the four arribadas. In addition to everything stacked against them, the turtles themselves are their own enemy. As thousands flap and flail around the beach at once, I saw countless turtles digging their nest right on top of where others had already laid their eggs, flipping out dozens of the others in the process. 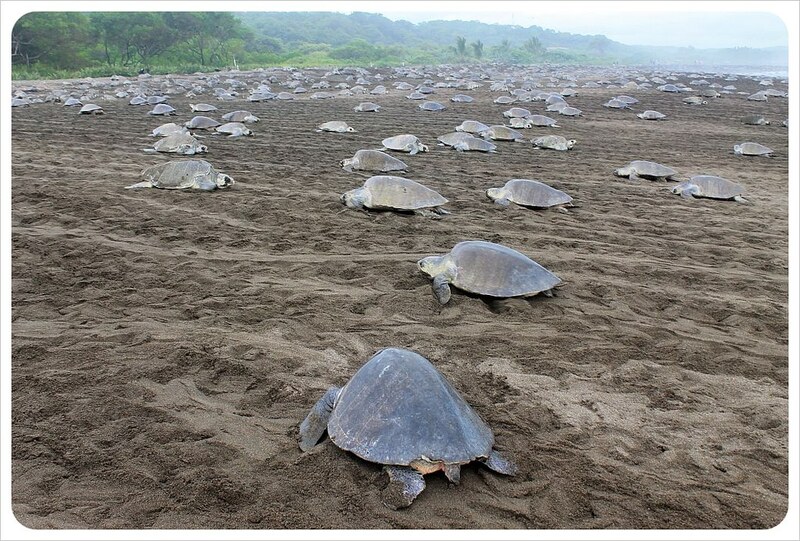 Even though 10 million or more eggs are laid on the beach each time, after the vultures, the dogs, the humans and themselves, only a fraction of the baby turtles will make it into the water for the first time. 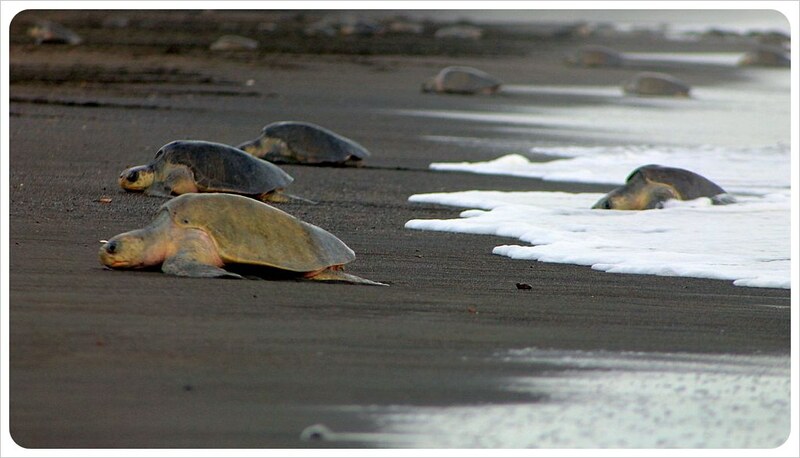 When they hatch 45-50 days after an arribada, only one in fifty of the tiny turtles will reach the water. Less than half the size of an adult human hand, the babies are easy prey for vultures and dogs as they wiggle their little white bodies into the sea, where even more predators lay in wait. 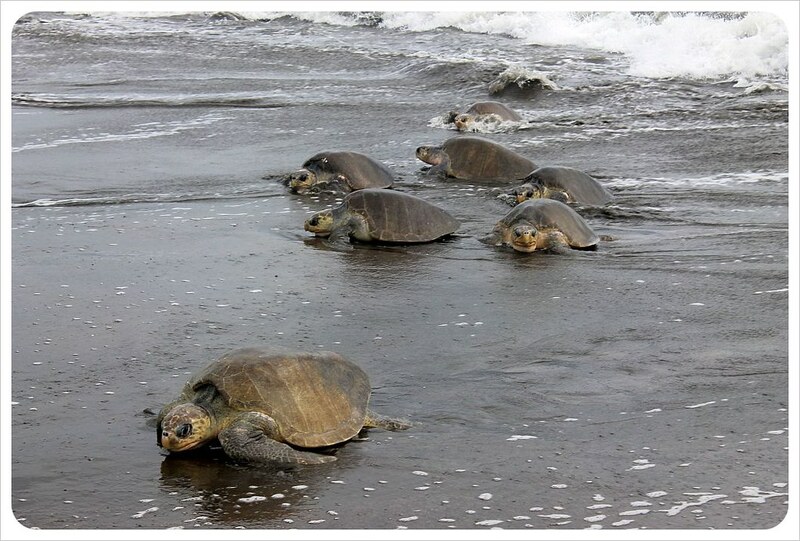 As we walk along the beach, more and more turtles emerge from the waves. 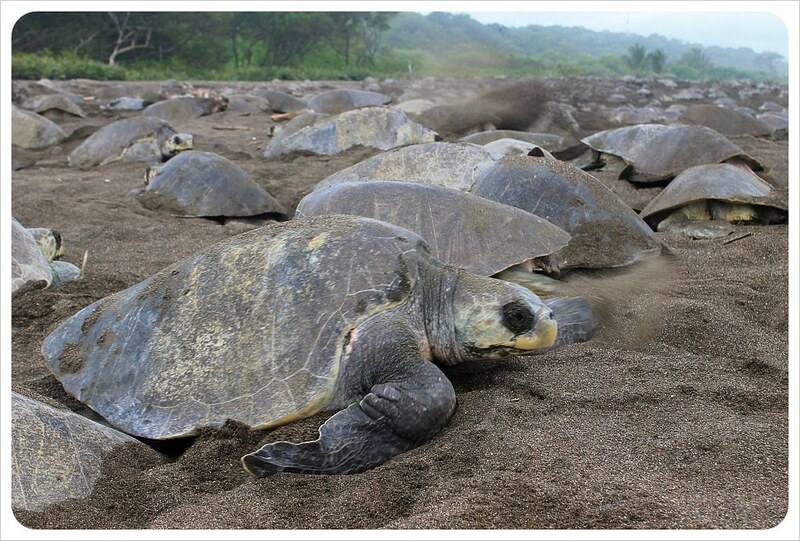 When we arrived around 3.30pm, there were only a few turtles out; an hour later, the beach appears to be made of boulders, so full it has become with turtle shells inching up and back down the beach. By sunset there are thousands of turtles and it is entirely chaotic, with turtles trampling over each other fighting for the few patches of sand left to make their own nest. 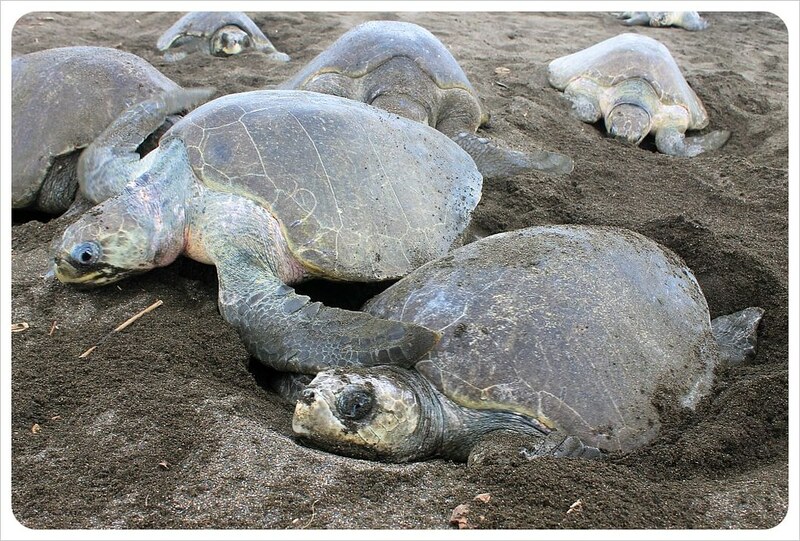 I sit down in the middle of a group of turtles, mesmerized by how they dig deeper and deeper into the sand. Their flipper covers me with scoops of sand until the depth of the hole satisfies them. By this time, the turtles are worn out, but rather than rest, eggs drop out from their insides into the hole, one by one. As soon as the sun sets, we leave the beach already planning our visit the next day. This experience is addictive; I can’t wait to see it again. We find out later that this particular arribada might have been the biggest ever in Ostional. It is the rainy season, however, and on the second day it pours down all day, making rivers uncrossable and standing exposed to whipping winds on the shore unbearable. By day three we are able to go again, the rain stopping just in time for an afternoon visit to Ostional. Denise prepares me, as we are set to see the slow, sick, injured and old turtles that arrive today. 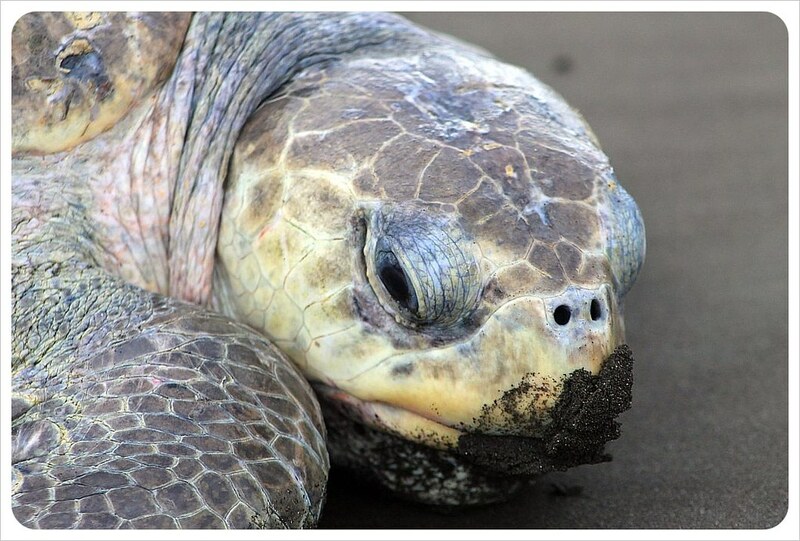 I see turtles with three legs, scars and pieces torn out of shells from shark bites, deformed turtles. 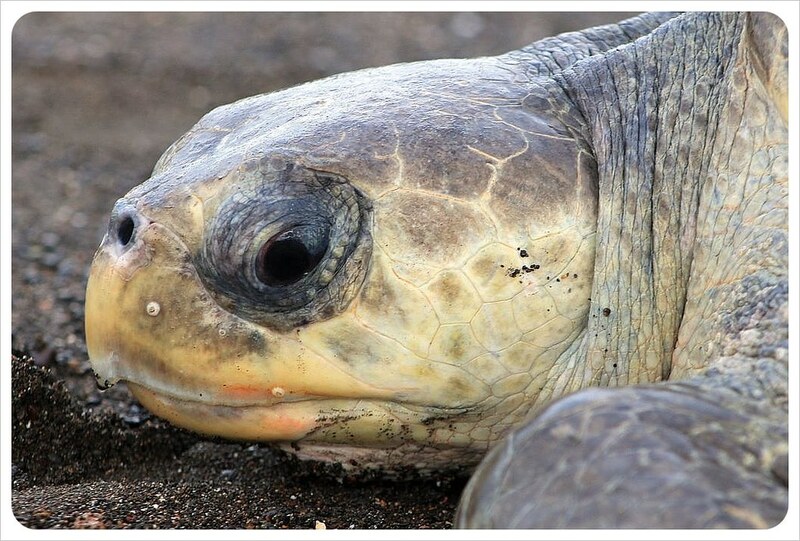 It is painful to watch these sick turtles, which have an even harder time dragging themselves onto the shore so much more slowly than the others. Many don’t have the power to reach safe nesting points out of the way of the tide, digging dangerously close to the shore. I wish there was more I could do, but we can only help by turning over the turtles when a wave crashes in and flips them over. 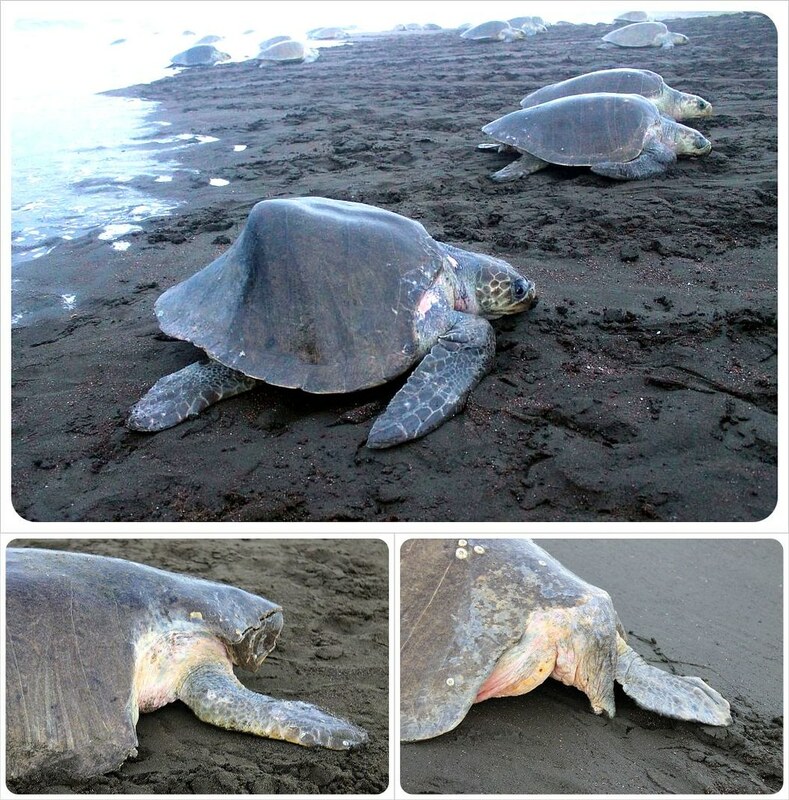 As this last batch of turtles limp back into the sea, the arribada comes to an end. 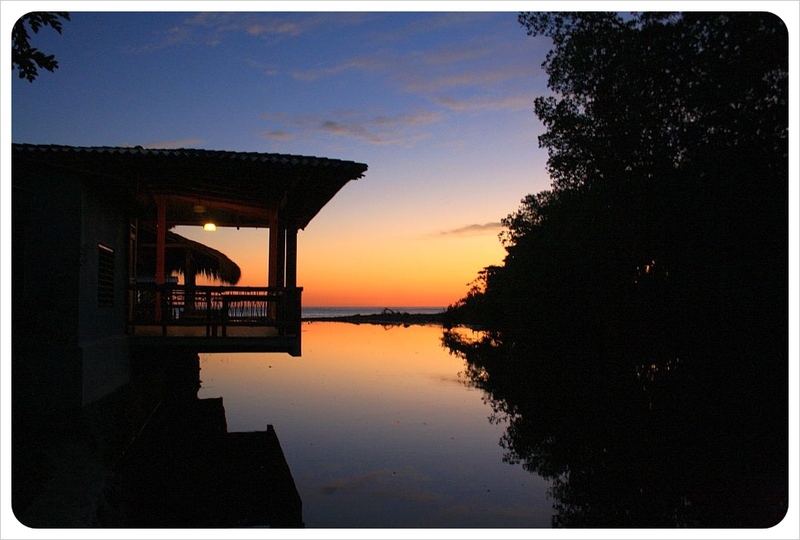 Ostional is located on the Nicoya peninsula; a small, unremarkable village most of the year, but there are a couple of inexpensive hotels such as the Turtle Lodge and a few restaurants. Located around 90 minutes north of Samara or a six-hour drive from San Jose, the nearest bigger town is Nosara, a popular surf spot, about half an hour south of Ostional. Flights leave occasionally from Nosara to San Jose and Liberia. 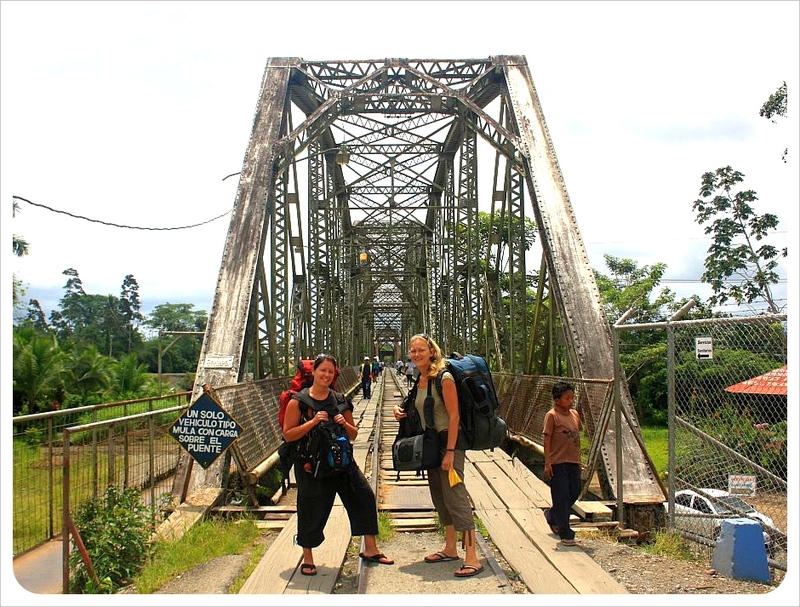 When renting a car, a 4 x 4 is a necessity to cross several rivers, which, in the rainy season, can be a challenge to cross between Nosara and Ostional. 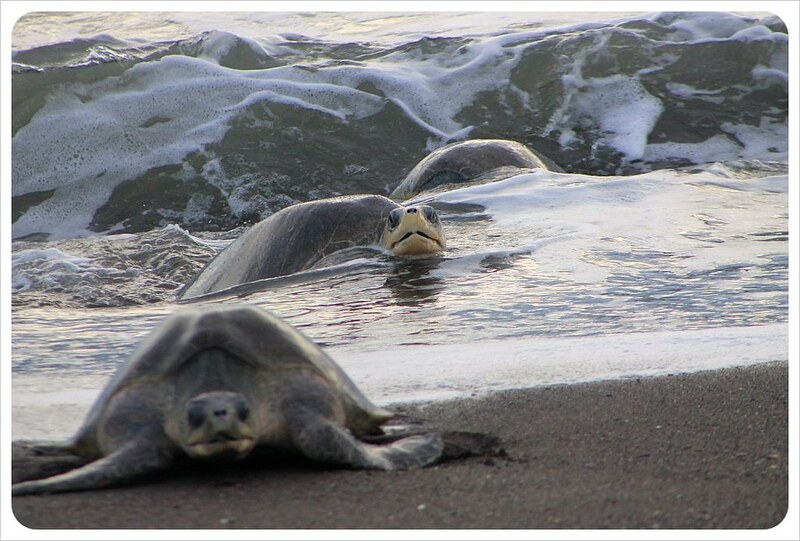 The majority of turtles come to the beach at night, but on the first three days there are turtles during the day as well. They start to arrive in masses around 4pm. Flash photography is not allowed. Ostional is a remote beach and arribadas take place in the low season. 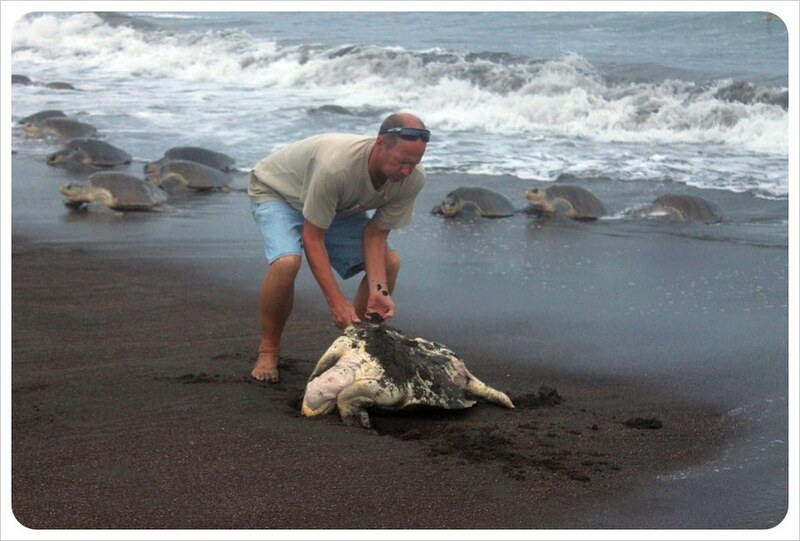 This combination means that there are never enough volunteers to help the hatchlings. 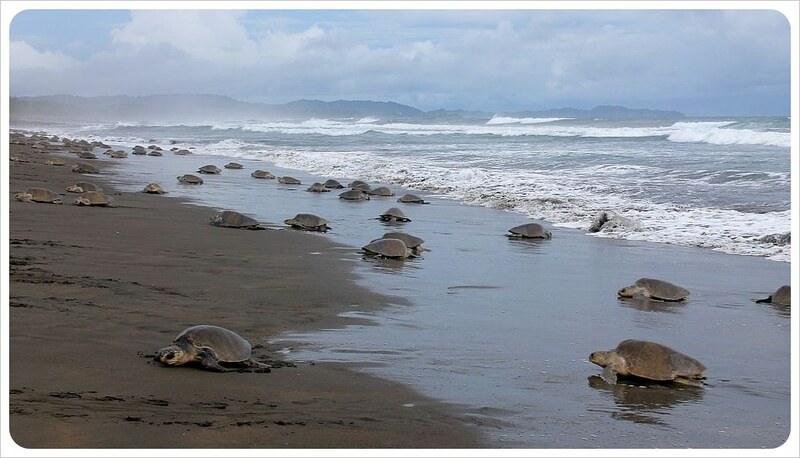 If you would like to help the turtles, you can do this by visiting the Asociason de Guias Locales de Ostional (Association of local guides – Ostional) Facebook Page for current information about arribada start times and when hatchlings need assistance with their epic journey to the sea. We both love sunsets, and there is nothing better than watching the sunset on the beach. You might think that two months on the Pacific Coast would make for many, many beautiful sunsets, but being rainy season, sunsets are few and far between. We usually have gorgeous mornings with blue skies and lots of sunshine, but the afternoons start off gray and cloudy and end with a down pour with a strength we didn’t even know existed. So whenever there is one of these lucky days when the afternoon rain doesn’t come, we take our puppy down to the beach to watch the sunset. We are either treated to colorful skies that change from bright blue to purple and orange, or a completely pink sunset. Either way, it never disappoints. A running theme of our travels is taking advantage of living life on a whim. Not that we don’t plan. Before arriving in a new destination, research and planning factor heavily into our how we spend our time. Where we go, however, changes on the turn of a dime, the drop of a hat, on a whim. 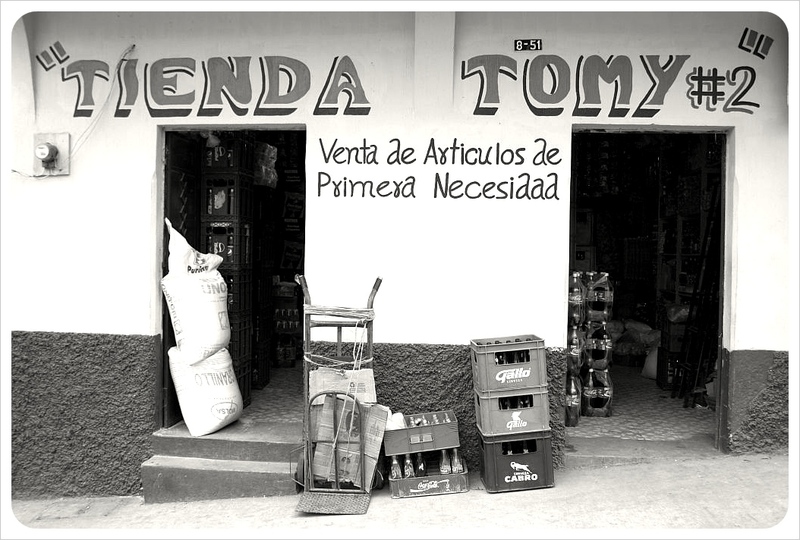 Once, it meant flying from Panama to Germany even though we had planned on continuing down to Colombia. Another time, it meant spending three weeks in Lisbon (and loving it! ), just because we had time to kill before flying to Canada. Most recently this meant a snap decision to spend two months in Costa Rica on the beaches of the Nicoya peninsula for a housesit. We had fully intended to travel Mexico for a month after our housesit there. Costa Rica was never on the plan until suddenly it was. Housesitting is another running theme, and one that we are increasingly passionate about as we continue the life of freedom we have established. It allows us to rest, cook for ourselves and really get to know a destination for longer periods of time. These last 100 days have been almost entirely spent housesitting. While we don’t regret a single whim, these past 100 days taught us a few things. Living a life on the beach is the stuff dreams are made of, but our views on that have shifted. We both still love the beach, and spending a month or two at a time hearing the waves crash against the shore, watching the sun set or rise beyond the horizon, soaking up that inevitably relaxed, chilled out culture that exists at the beach…we love those things. But we are city people. We need culture, restaurants, art, and the chance to watch the millions of different ways that people express being human all in one place. We certainly lived out one of those sitting-in-the-office, dreaming-of-what-you-would-do-if-you-won-the-lottery dreams these past 100 days, but in between the two housesits, stopping in Mexico City was an absolute must, and now we are about to put our ‘life on the beach’ dream behind us and moving on to another dream. To live in Buenos Aires, Argentina for a month. Before we left, over 900 days ago, we originally looked at flights from London to Buenos Aires via Rome. Instead, on another whim, our trip began in Las Vegas. Every time we start a new leg of our travels, however, we always assume it will be Buenos Aires and then all of South America. Somehow, it took us over two years, but now the flights are booked and this dream is real. And to think, the next time you read one of these reflections posts, the big 1000 days celebration set of reflections, we will have been and gone to Buenos Aires and will be tasting our way through Argentina’s wine country or hopping around glaciers at the bottom of the world. After a month in the Argentine capital, we’ll get back into a rhythm that we had been keeping before these last 100 days. We have only been to two countries in that time. Just Mexico and Costa Rica. And in those two countries, we have only really been to four or five places, since housesitting took up huge chunks of that time. This complete stability is what has been so unusual about days 801 – 900. We traveled at the rate of a tortoise, but we needed that. Maintaining breakneck speed, changing hotels (and towns!) every few days is exhilarating in spurts, but the longer we continue the journey, the longer these breaks in between need to be. Despite a spot of navel gazing about whether we had lost our travel mojo, the butterflies have begun, wine and cheese palates have been whetted and we can’t wait to wipe off our moldy passports and move in to our Buenos Aires apartment (which we found on Wimdu.com) to explore the city, and the country, where this whole journey was supposed to begin in the first place. Read on for our top travel moments and most disappointing places in our Tops & Flops of 900 Days of Travel! 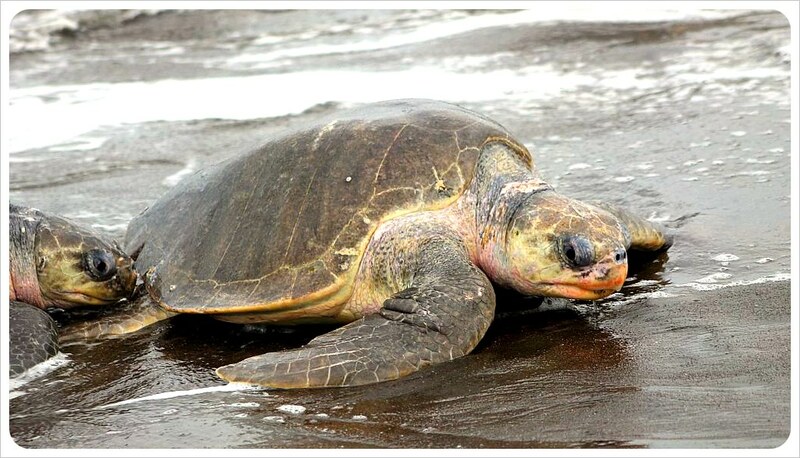 The thing we love most about Costa Rica is undoubtedly the wildlife. The variety of animals here is unmatched anywhere else we have ever traveled. Just walking down a random street anywhere outside of the urban central valley, you are surrounded by colorful butterflies and hummingbirds and chances are great that you’ll see monkeys, ant-eaters and beautiful birds everywhere. If you look carefully you can even see sloths in the trees, and if you do a bit of research, you can see sea turtles nesting on the beach. 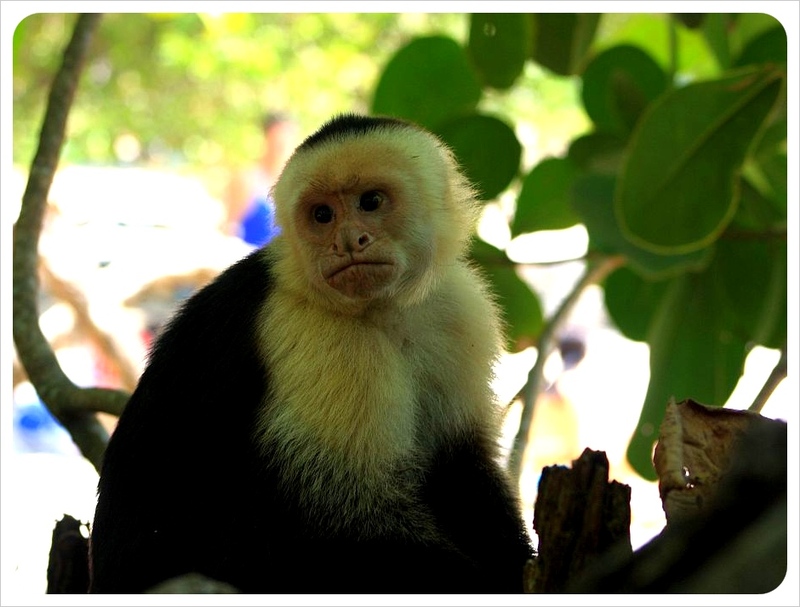 Where we are staying right now, we don’t even need to leave the house – the monkeys come right into our backyard! In the mornings we are usually woken up by the howler monkeys at 5am and a family of monkeys, including this cute baby monkey, likes to eat leaves from a tree in our yard. 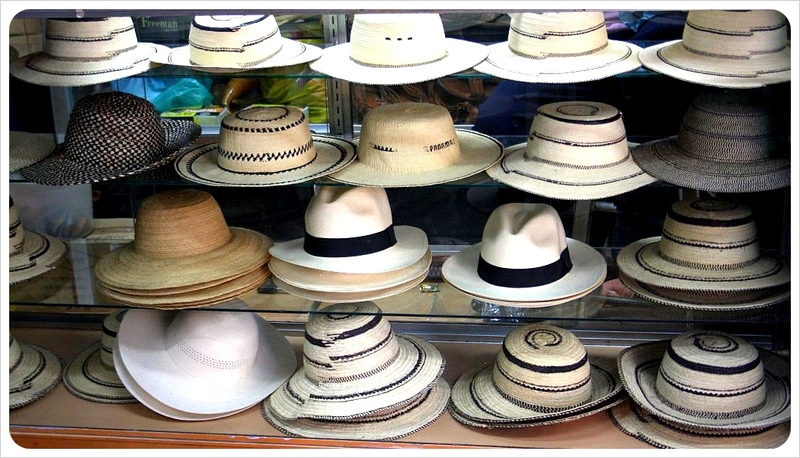 No matter how hard we try, we just don’t like Costa Rica’s capital city. As Jess put it last week in a post, ‘San Jose lacks the colonial charm of other Central American cities and unfortunately fails to fill the space with a modern, chic vibe.’ However, the city has some great street art, and as our long-time readers now, we are huge fans (see all our posts on Street Art here). We stumbled across some cool graffiti in San Jose last year, but this year we found even more. The German Goethe Institute has started a cross-country street art project called ‘De Mi Barrio A Tu Barrio‘ (from my neighborhood to yours), which showcases talent from communities throughout Central America, connecting people across cultures through street art. Painter Jim Avignon traveled though Central America and the Caribbean for six weeks this year, painting graffiti with local street artists in every country, and they added some fantastic pieces to the streets of San Jose. You can see more street art and read more about the Di Mi Barrio A Tu Barrio project here. A trip to Costa Rica is about spotting incredible wildlife, surfing perfect waves and soaking up the sun and the capital does not reflect the wonders that the rest of the country has to offer. San Jose lacks the colonial charm of other Central American cities and unfortunately fails to fill the space with a modern, chic vibe. The result is a practical city that most travelers use to transfer in and out of on their way to the beaches, volcanoes and the airport. 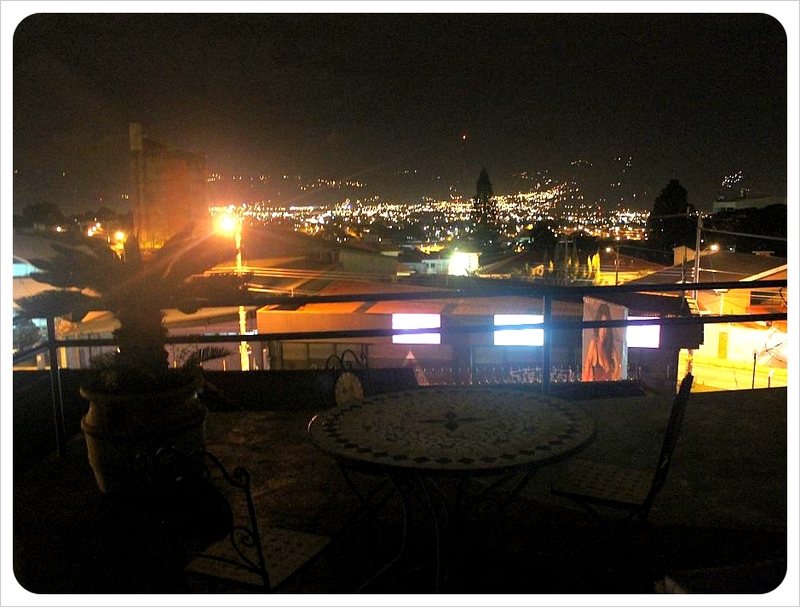 But sitting up on the roof terrace at Casa 69, watching the lights twinkle out and up into the mountains beyond the city managed to make even San Jose feel pretty magical. 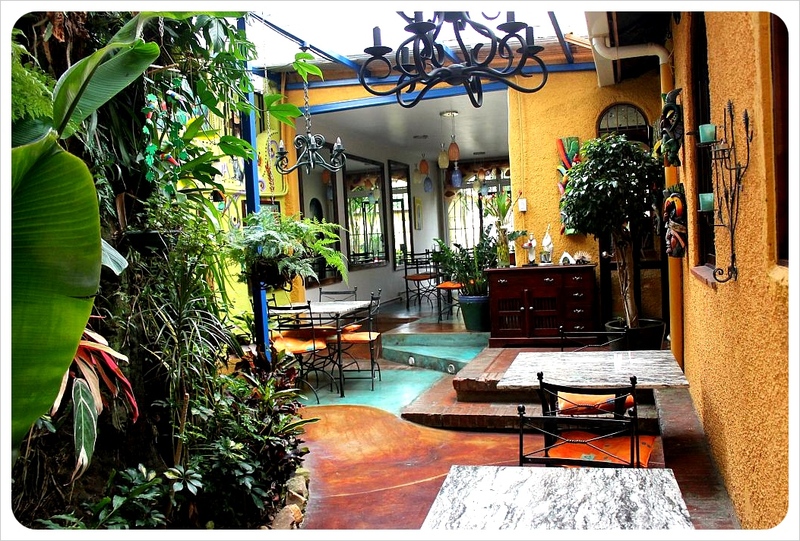 Day and night, Casa 69 Bed and Breakfast feels like a refuge from the city and feels more like a home than a hotel. Entering the yellow walled property through a blue metal door off a side alley puts guests straight on a walkway in what feels like a lush green jungle garden, and leads into a living room with a large L-shaped couch and arm chairs to sink into, a big TV and a computer and a printer as though in someone’s private home. Across the hall there is a dining room with a dark wood table and shelves with maps, pamphlets and guide books. The check-in is in here, at what is the kitchen counter. The breakfast nook is cosy, bright yellow room where from 7-10am, the breakfast of coffee, tea, bread, butter, jam and fruits is served each morning. Heartier breakfast meals are available for around $5 each. Our room was all the way up at the top on the roof, and we had those great mountain views from our bed. The black and white comforter and sequin pillows felt a little flamboyant (I go for big fluffy pillows and gluttonous amounts of comfort) but the king-size bed felt amazing after a long travel day. While the room extends that feeling of staying at a ‘friends’ house, the en-suite bathroom brings value to the room, with its recently renovated feel, excellent shower, pedestal sink, great use of space and crisp, clean design. The hotel’s Wi-Fi wasn’t great though. It works best nearest the router, which means some rooms get a great signal, others get none. Ours was intermittent at best. Looking out at the city beyond, watching the thick rain clouds pour over the mountains in the afternoon and clear up by night fall feels great, though at some point the intense coils of sharp metal wire and wrought iron bars bring back the reality of the city beyond the walls of the hotel. 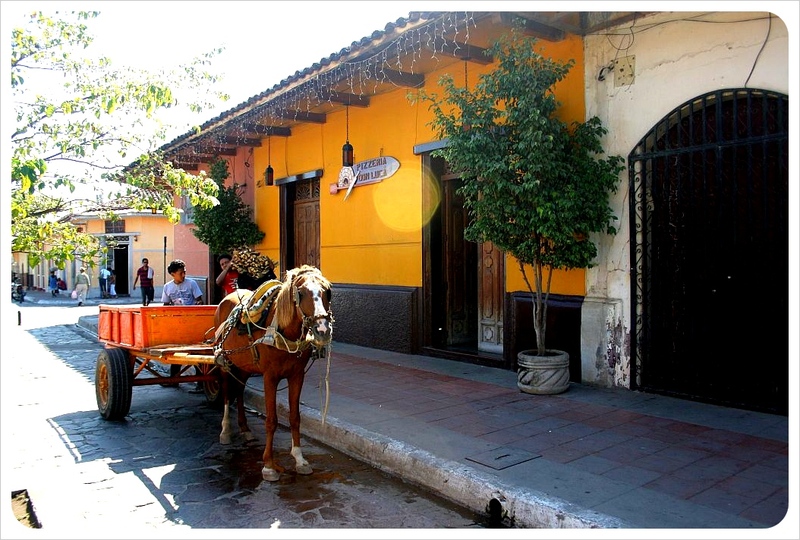 San Jose is not a particularly dangerous place, and we felt perfectly safe walking into central San Jose to the Paseo Colon pedestrian area, a 20 minute walk from the hotel passing the national museum, a tourist market, churches and restaurants along the way. 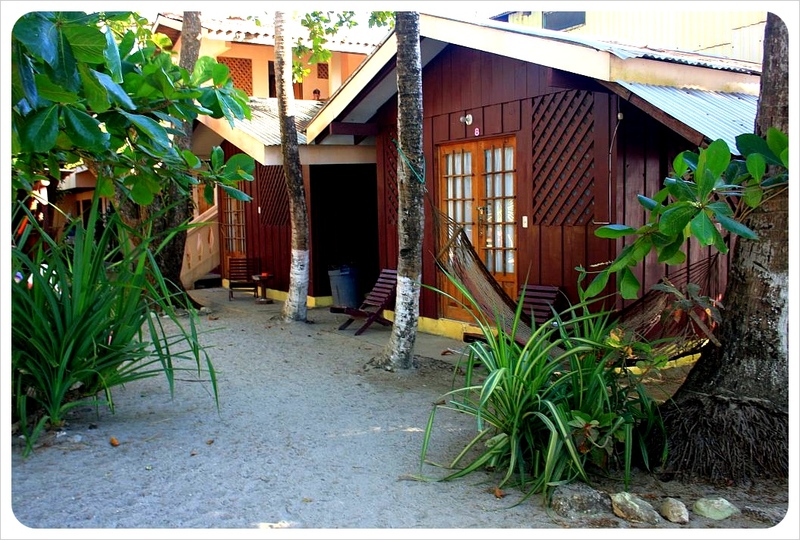 Casa 69 is just across from the Nicaraguan embassy, a minute from an Irish rock pub, and around the corner from a typical Costa Rican ‘soda’ serving up typical Tico food and a Pizza Hut for travelers in need of fast and easy comfort food. We left at 5am the next morning and the night manager was up and happy to call us a cab, just as had been promised the night before. This was the first gay-owned B&B we had stayed at in Central America, and we were impressed with what a well-oiled machine it is, with friendly owners and staff all around, plus several cats and puppies to warm even the coldest of hearts. This isn’t the most original, and honestly, the rooftop views are pretty stellar. But the large bed was unexpected and felt extravagant. It is also comforting to know about a dependable, comfortable place to stay in San Jose for all those times we transfer through this major travel hub. Our rooftop room had sliding glass doors, which were great for floor to ceiling views, and then a wrought iron gate which closed and locked in front of the doors. But the sliding glass door itself did not lock and could easily be opened. Granted, a thief would have be pretty wiry to get in under the last wrought iron bar and into the room, plus pretty sneaky to make it into the house, through the living room, kitchen, up three flights of stairs and to that door to begin with, but I want my door to lock no matter what. A second suggestion is regarding the breakfast element of the Bed & Breakfast. The nature of travel to San Jose means that many guests are likely up and on their way to a bus or the airport before the 7am breakfast time. The owners knew we were leaving early and a couple had left the day before at 4:30am. Because breakfast is included in the room rate, I’d like to see Casa 69 (and all B&Bs for that matter) up their game a bit and offer a takeaway breakfast bag with a bit of bread and butter/jam and a coffee to go. Casa 69 is a friendly, stable spot to stay in San Jose, perfect for arriving to or leaving from for long flights or bus rides and a stay of a week or so would allow guests a sense of home in the Costa Rican capital. This summer ended with us moving on from our housesit in Mexico, where we escaped Hurricane Ernesto, to the next housesit in Costa Rica – just in time for us to experience the long-awaited ‘Big One’. At 7.6 on the Richter scale, this earthquake was intense and lasted roughly 60 seconds, an eternity when the world is literally shaking. We had arrived the day before and were just settling in at our new beach house when we found ourselves sprinting outside barefoot across the gravel driveway with the homeowners. For the next two months, we are caring for a house that belongs to a family of surfers from the U.S. and couldn’t feel safer considering how well the house held up in the earthquake. Not a cup, plate or picture was out of place, while some of the local houses were totally obliterated and the supermarket looked like the apocalypse. 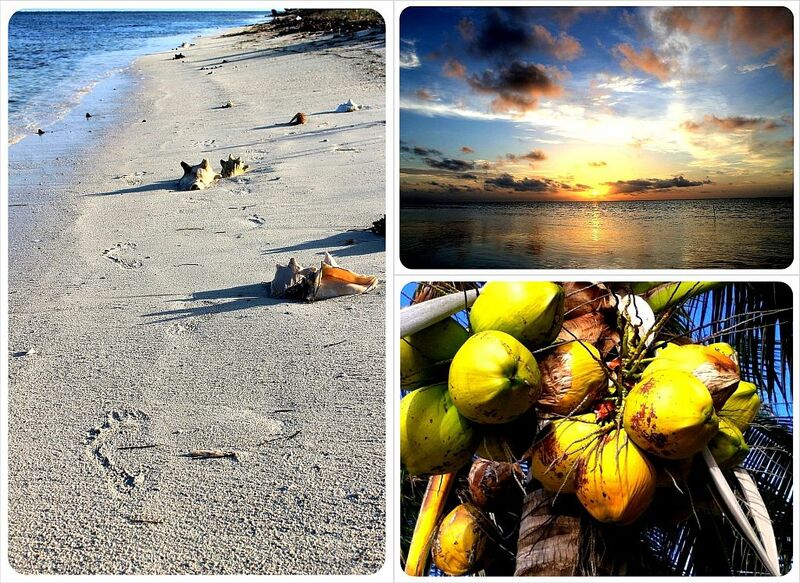 While life is still a beach for us, our surroundings could not be more different. Instead of the glare of the bright blue Caribbean shining at us from all angles in Mexico, now the crashing waves of the Costa Rican Pacific thunder in the distance. The house is set high on a hill, just 500m from the beach as the crow flies, but we are surrounded entirely by lush, tropical jungle. Howler monkeys eat, sleep, play and howl in the trees right by the infinity pool, waking us in the morning and entertaining us throughout the day. A new pet has entered our lives as well. We are looking after an adorable little mutt with a Napoleon complex who most definitely thinks she runs the show. I took to her right away, but Dani was still truly heartbroken leaving our last dog in Mexico. Two months is the longest we ever spent with a pet before, but her heartbreak was more intense because they really had a very special bond. Two months was also a long time to hang out with our new Kiwi friends. We miss them a lot too, although it may have been the best thing for all of our beer bellies to stop hanging out for a while! Down at the beach, we got into a really comfortable routine, which started at sunrise taking the dog out for a walk on the beach, and ending with snorkeling and/or dinner with the Kiwis more and more often as our housesit days dwindled. At three weeks into our remote housesit Dani and I were suffering from cabin fever, yet after eight weeks we could have easily stayed eight weeks more. Now, in our new home, there is one aspect of life that is infinitely better – we are back on the grid! Lights can be switched on and off freely and ceiling fans can stay on all day if we want without worrying about how many amp hours the solar batteries have or lugging out a hundred pound generator to make more electricity. Oh and the internet…After eight weeks of only 350MB of downloads per day, we are now free to surf the web at will. We can use Pinterest again (just 20 minutes on Pinterest at through 50MB of our 350MB limit, to put that into perspective), listen to Spotify radio while we work, download podcasts, and the most glorious of all – we have YouTube again! It could not feel better to be back online and on the grid. Monkeys, an infinity pool and a cute little dog don’t hurt either! 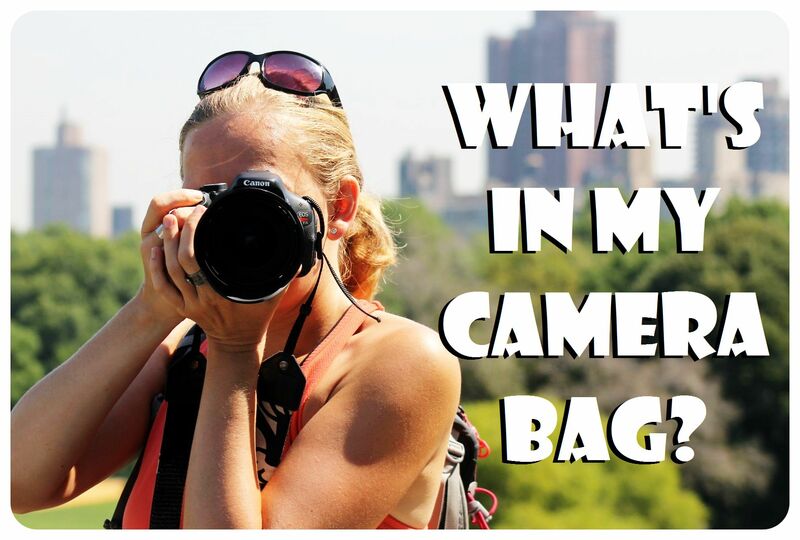 Let us know if you have any questions about how we housesit around the world. We’re happy to share advice and experiences with you.